The 2016 edition of the General Conference of ECPR (European Consortium for Political Research) took place in Prague, 7-10 September 2016. Approximately 2000 participants presented their most recent work in political science, policy analysis, public administration and related areas of inquiry in almost 70 different sections. 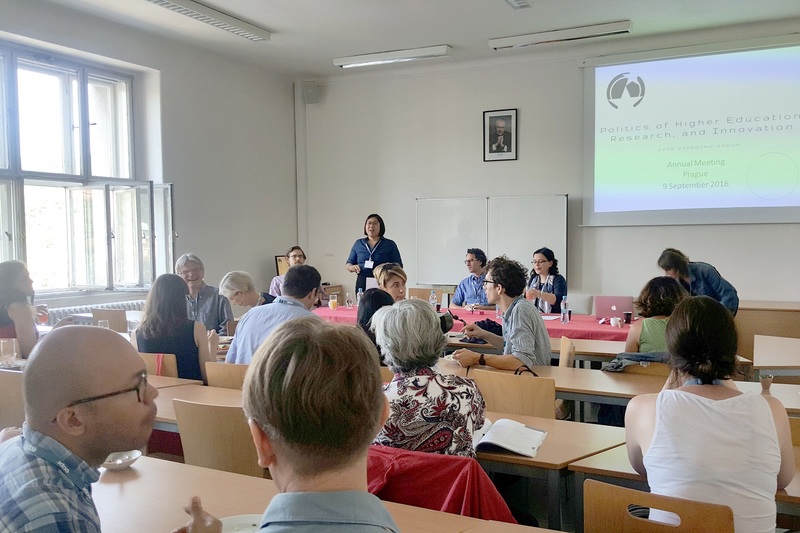 The newly formed ECPR Standing Group on Politics of Higher Education, Research and Innovation, for the fifth time in a row organized a section dedicated to knowledge politics and policies. The section consisted of eight thematic panels comprising 3-5 papers each, spread over the three conference days. First, ‘Applying Complex Systems Theory to Higher Education and Research Policy’ panel looked beyond the commonplace description of political and policy phenomena as complex and discussed the possibilities of using complexity theory for public policy analysis. It featured presentations by Graham Room about agile actors on complex educational terrains (author of the 2011 book on Complexity, Institutions and Public Policy) , Sandra Hasanefendic about using complex adaptive system theory for analysing behaviour of higher education institutions, Mads P. Sørensen on complex policy conditions conducive to scientific breakthroughs and research excellence and Mitchell Young on the linkages between policy dynamics and biological systems. The second panel – ‘Market-Making of, in, and around European Higher Education’ – focused on marketization of higher education, both as a process and as an outcome. Janja Komljenovic presented her work on actors involved in the process of construction of ‘diverse, variegated, processual and relational’ markets. Christopher Pokarier focused on expansion and downscaling of higher education market in postwar Japan, while Lukas Graf focused on decentralized cooperation in skill formation. Eva Hartmann then shed light on international coordination service firms (European Quality Improvement Systems (EQUIS) and their role in privatization of higher education. Finally, Susan Robertson focused on contradiction between the global trade agreements in the making (e.g. TTIP, TPP) and a creative and dynamic knowledge-based economy. This was followed by a panel on ‘Policy Failures and Achievements in the Knowledge Domain’ which focused on policy success and failure in conceptual terms (what constitutes failure? ), in terms of implications of failure for the policy process as well as in empirical terms (focusing on specific cases). For example, Damien de Blic and Anne Marijnen presented how universities in France reacted to the refugee crisis and how limited initiatives in this respect (largely by individual universities) shaped the political agenda on this matter. Mari Elken focused on the concept of policy failure as such, as well as in particular in relation to the European level policy coordination. The panel concluded with Daniel Kontowski’s presentation on antecedents and consequences of several (largely failed) attempts to introduce liberal education in Poland. As is becoming tradition, the section also included a panel more explicitly focused on ‘Researching the Governance of Knowledge Policies: Methodological and Conceptual Challenges’. 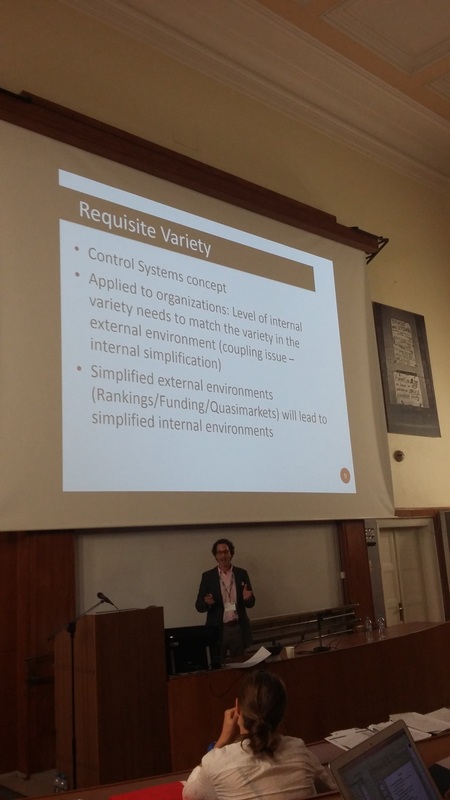 First, Teele Tõnismann presented her work on plurality of external influences on research policies in the Baltics, in particular highlighting the necessity for careful consideration of similarities and differences between systems when conducting comparative research. This was followed by Inga Ulnicane’s work on researchers’ motivations for collaboration that builds on an expansive data set including interviews, site visits, longitudinal case studies, publication and citation data, and CVs. The final day of the conference started off with the panel on ‘The Contentious Politics of Higher Education. Students as Political Actors in Times of Crisis’. Four papers were presented: (1) Thierry Luescher’s work on student movement in South Africa, in particular focusing on recent #FeesMustFall protests, (2) Cesar Guzman-Concha’s work on student protests in Chile, in particular on their outcomes and impact on Chilean HE policy, (3) a paper by Lorenzo Cini on student mobilizations in Italy and their policy influence and, finally, (4) Alexander Hensby’s work on the 2010 student demonstrations in UK and how mediation of highly charged ‘moments of excess’ influenced the student mobilization and public visibility of tuition fees as a contentious policy issue. This was followed by a panel on ‘The Impact of Changing Knowledge Policies’, which featured presentations by (1) Mounia Driss on higher education and welfare regimes – in particular concerning the (possible) alignment between de-commodification efforts and social security policies, (2) Karel Sima’s work on demographic changes in Central and Eastern Europe and how they may affect the politics of access to higher education and (3) Beverly Barrett’s work on higher education attainment in the context of the Bologna Process, specifically concerning Portugal and Spain. In the afternoon, the panel on ‘The Politicization of Knowledge Policies: Actors in National Arenas’ highlighted the role of different political actors in the process of knowledge policies. First, Jeniffer Chubb presented her work on perspectives of academics from UK and Australia to an increasingly present ‘impact’ focus in research funding policies. This was followed by Alexander Raev who discussed transnational higher education projects (some of which are profit-oriented) and the actors involved in designing them, specifically focused on their (sometimes diverse) interests. Then, Miguel Antonio Lim focused on university rankings as ‘active instruments’ and in particular the actors which created them and the actors which use them in their own national contexts, illustrating these processes with examples from Denmark and India. Margarida Chages Lopes presented her analysis on Portuguese higher education reforms and the panel ended with Jens Jungblut’s (co-authored with Deanna Rexe) comparison of approaches to federal coordination of higher education policy in Germany and US. The section was concluded with the panel ‘Transnational Actors in Knowledge Policies – Ideas, Interests and Institutions’, i.e. various non-state actors operating on macro-regional (e.g. Europe, South-East Asia) level and their role in knowledge policy-making. The panel comprised: (1) Pauline Ravinet and Meng-Hsuan Chou’s presentation on how a specific instrument of cross-region cooperation – ‘EU Support to Higher Education in ASEAN Region (SHARE)’ – is framed, (2) Didem Turkoglu’s comparison of student groups and unions in England, Germany and Turkey, (3) Que Anh Dang’s analysis of so far under-researched actors – Bologna and ASEM Education secretariats, (4) Tore Bernt Sorensen’s work (co-authored with Susan Robertson) on inclusion of non-state actors in the work of OECD and (5) Martina Vukasovic’s theoretical paper on European stakeholder organizations (EUA, ESU, EI etc.) as meta-organizations. Apart from these eight panels, the members of the Standing Group on Politics of Higher Education, Research and Innovation also attended some of the panels in other sections, as well as the roundtables and took part in the annual meeting of the Standing Group on Friday, 9 September. The latter was an excellent opportunity to take stock of the development of this research community (currently comprising more than 200 members) as well as publication outlets and plans for the future, including the next year’s ECPR General Conference in Oslo, 6-9 September 2017. This entry was posted in Education, Global & International, Politics & Public Policy, Publications & Events, Science & Technology, The EU and tagged Europe of Knowledge, higher education, international collaboration, knowledge economy, Research funding, research impact, research policy, universities, university rankings. Bookmark the permalink. Previous: Knowledge Policies and the State of Inequality: Instruments For or Against?